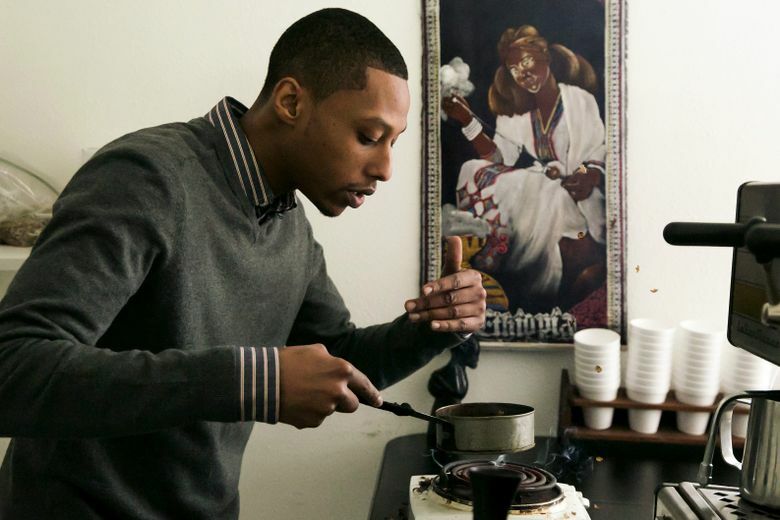 Solomon Dubie, 27, wants to update the traditions of his family (originally from Gondar, Ethiopia) and introduce a new, increasingly diverse, generation of caffeine junkies to the coffee he grew up on. This city is known for coffee. From the green and white mermaid that sent giant lattes around the world to the stylish indie shops that dot our neighborhoods today, “fancy espresso” is bound to make its way onto any list of Seattle stereotypes. We’re also home to one of the largest Ethiopian communities in the country (approximately 10,000 strong) — a people who can claim to be among the first to discover coffee beans. It may seem like a perfect fit, but these two coffee cultures rarely mingle in Rain City. You’ll likely find Ethiopian grounds in your local cafe, but they’re destined for espresso shots not the slim-necked jebena — or brewing jug central to Ethiopian coffee ceremonies. But one Seattle son has plans to change all that. Solomon Dubie, 27, wants to update the traditions of his family (originally from Gondar, Ethiopia) for a changing city and introduce a new, increasingly diverse, generation of caffeine junkies to the coffee he grew up on. “You’ve got your French press, your pour overs, your espresso,” says Dubie from behind the counter of his South Seattle convenience store, Rainier Mini Mart. “And then you have this very different element,” he adds, fondly patting the round base of an obsidian black jebena. He’s taking me through an abbreviated version of an Ethiopian coffee ceremony, which — when headed by his mother — would typically include incense and popcorn (a traditional snack with coffee in Ethiopia) and take at least an hour and a half. For our purposes, he’s just brewing the coffee Ethiopian style. That means roasting the raw, green beans in a small pan over a hot plate, grinding them and placing them in a water-filled jebena — where they bubble cheerfully as Dubie tells me how he fell in love with coffee. Dubie says the love of coffee came early, but the desire to turn that passion into a business developed while studying communication at Eastern Washington University. While there he began wondering if the ancient coffee rituals and brewing methods he grew up with might be of interest to those outside the Ethiopian community. After graduation he took a coffee-centered tour of Ethiopia and returned to Seattle, hoping to open his own cafe. “This was one of the first forms of brewed coffee ever, ever. That’s amazing to me,” says Dubie while pouring me the avole, the first of three cups of coffee. Tradition dictates that the jebena is re-brewed with the same grounds each time, creating a diminishing intensity and shifting flavor with every tiny, sugar-sweetened cup. After being turned down for a loan, he saved up money working as a parking-lot attendant and bought this convenience store with the hopes of converting it into his dream cafe some day. He says the last few years have taught him a lot about business (“It’s hard and you need a lot of dedication”) and helped him develop his ideas further. He now envisions a community space — something he says is deeply needed in South Seattle, a diverse and growing neighborhood — with Ethiopian coffee at its core. If his dream becomes a reality, there will be full coffee ceremonies available for groups and parties, as well as a thrice-brewed jebena for couples or freelancers on laptops. He’ll have European-style pastries and Ethiopian sweet bread (himbasha) available and even imagines classes in how to make your own Ethiopian-style coffee with beans he imports, packages and brands. It will be named Avole after that first strong cup of coffee. He hopes to be open in May if loans and his online fundraising campaign — designed to help him raise the $17,000 needed to transform his mini mart — come through. And after a drizzly morning spent in his company, with a jebena full of strong, hot coffee at my side, I can, too.